Online polling for the election kicked off Tuesday and will be running until April 4 at 9 p.m.
“I voted to see if the system would actually let me. It did,” said Sommers, who provided The Link with screenshots from the online voting platform Simply Voting. Sommers said she alerted Chief Electoral Officer Florian Prual right after so her vote could be withdrawn. Online voting has been in place since January, when the CSU ran a by-election to ask students for approval for online voting and reorganizing the fees they collect from students. Prual was made aware of the situation at the same time as The Link. He said so far he’s only heard of three alumni being offered a chance to vote online, and said once polling is complete any votes found to be made by alumni will be withdrawn. Outside of the three Prual mentioned, The Link was able to confirm a fourth person not eligible to vote also received an email inviting them to vote. While the person hasn’t officially graduated yet, they’ve finished all the credits needed for their degree haven’t been enrolled in any courses this school year, making them ineligible to vote under the union’s by-laws. He said the list of electors was provided by the university. 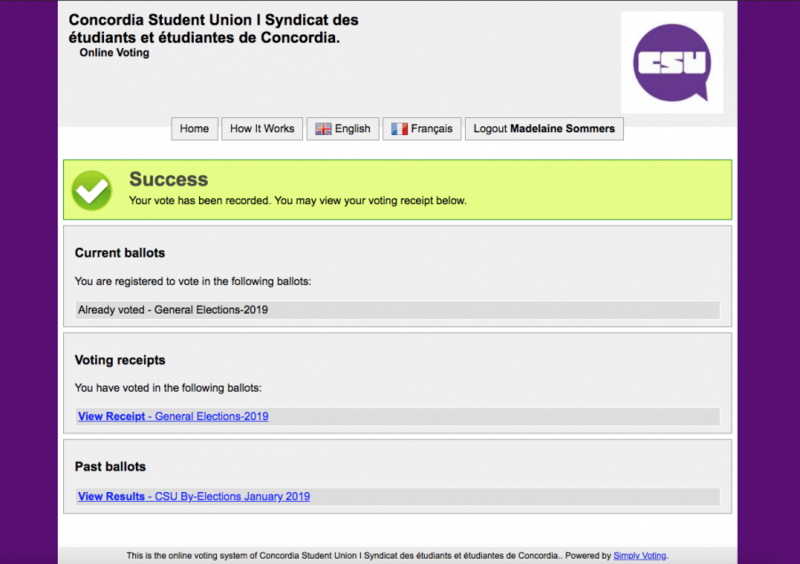 Right after online voting was approved in January, CSU IT Director Camil Gagnon-Duguay sounded alarm, saying the process was being rushed and there was no guarantee online ballots would remain secure. “We believe that the amount of time to test and ensure a no flaw voting system is not sufficient,” Gagnon-Duguay told The Link at the time. The article has been updated to reflect an updated count of the number of non-students being invited to vote online.